Thu., Oct. 25, 2018, 5:14 p.m.
Saturday’s Big Sky Conference clash between Eastern Washington and Idaho has a decidedly local flair rooted in the area high schools. Both teams’ rosters are dotted with players from across the region. 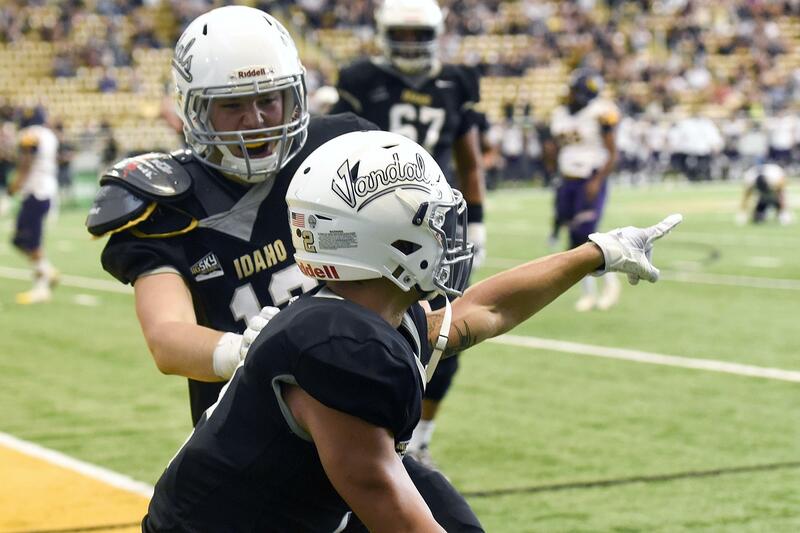 The Great Northern League is prominently featured, with four teams and 13 players represented, 12 on Idaho: West Valley–TE Connor Whitney, DB Tevin Duke, WR Collin Sather, TE Blake Horlacher; Cheney–LB Ty Graham, FB Logan Kendall, LB Chris Fuentes, DL Keenan Williams (EWU); Pullman–WR Dave Ungerer, WR Mason Petrino, WR Jed Byers, LS Cameron Lang; Clarkston–DL Dylan Beeler. EWU: DB Cole Karstetter (Ferris), OL Risone Ama (Mt. Spokane), DL Blake Ochsner (Lewis and Clark), OL Jack Hunter (Gonzaga Prep), OL Beau Byus (Central Valley), DL Jonah Jordan (Mead), K/P Seth Harrison (Coeur d’Alene), WR Micah Mason (CV). Idaho: K Cade Coffey (Lakeland), QB Colton Richardson (Lewiston), WR Jagger Jacobi (Mt. Spokane), LB Ross Chadderdon (CdA), RB Jack Bamis (G-Prep), LB Kyle Perry (Sandpoint), LS Alex Boatman (Lewiston), OL Carlos Collado III (Sandpoint), DL Correy Quinn (CV). Several area teams were represented on the Fall Team Academic State Champions list published Thursday by the Washington Interscholastic Athletic Association (WIAA). The Scholastic Awards Program recognizes the team with the highest grade-point average among all Washington high schools in their enrollment classification. In the 4A ranks, G-Prep football (combined 3.265 GPA) and Mead girls cross country (4.000) were honored. Others receiving recognition were: 2B–Kettle Falls girls cross country (3.975); St. George’s boys soccer (3.517); Northwest Christian girls soccer (3.830); Colfax football (3.480); 1B–Almira/Coulee-Hartline football (3.591). Student-athletes in the Greater Spokane League and their parents will get a strong dose of reality about the world of college recruiting from national keynote speaker Jack Renkens on Monday at 6 p.m. at G-Prep. Renkens will share the lessons he learned during many years as a high school and college coach, athletic director and parent of a high school athlete. He founded Recruiting Realities to debunk myths and present facts about athletic recruiting for student-athletes, their families, coaches and school counselors. Published: Oct. 25, 2018, 5:14 p.m.